Creating false teeth is a fun way to alter a person's appearance for either theatrical applications or just for enjoyment. The technique described here is quite similar to that used by dentists. Begin by casting the actor's teeth using a dental tray filled with alginate. Alginate is a dental material for casting that does not completely solidify. Do not use plaster to cast, as you will damage the teeth. After about 3 minutes, the alginate will set and can be carefully removed. If you don't plan to fill it with plaster, sink it in water for a few minutes so it doesn't shrink. Mix a little Ultracal and carefully pour it slowly into the mold. Tap the mold a bit so that any air bubbles present are popped. Afterward, let it set for approximately 45 minutes, and then the molds can be separated. Use a rasp or small coping saw to fix your edges once the molds are separated, being careful not to cause any damage to the cast. To cut away any excess, use a razor knife or scalpel. Take care not to exert too much pressure on the mold so it is not broken. Create a design on paper if you're looking to make just a handful of teeth, such as a set of Dracula fangs or enormous incisors. Then, using a razor knife, cut the design using wax or clay. Follow the steps above to finish. Use acrylics to color your fake teeth. Fill your mold with acrylic and then dip your casted teeth into them. You can use a few shades of white to get the same tone as the actual teeth you're copying. 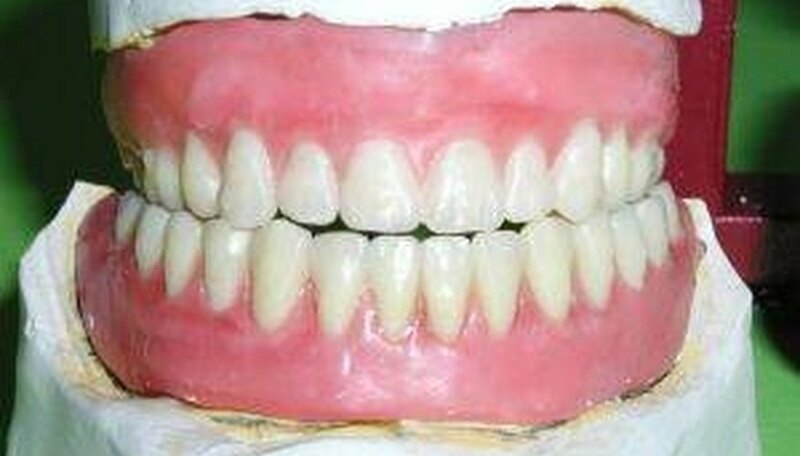 Red acrylic is used for gums. Finally, sand down the rough spots. Toothpaste helps. Greasepaint can be used to enhance the edges of your new set of teeth. When putting the dental tray with algiinate in someone's mouth, have him lean over a sink so he doesn't get drool down his throat. When applying solvent, do so in a well-ventilated area. Sand as necessary to ensure proper fit and painlessness.